for Laser and Inkjet Printers, 3½" x 11"
Create, design and print your own professional tent cards for your next event. 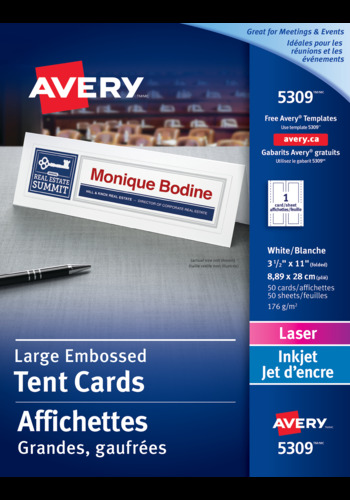 Avery® Large Embossed Tent Cards for inkjet and laser printers are a perfect complement to table tops that help identify speakers, attendees, companies, products and more. Made of a premium heavyweight and embossed card stock that is pre-scored, they sit perfectly on top of any flat surface for great visibility. The embossed border has a great visual impact and makes the text stand out. Print only as many cards as you need with the ability to make last minute edits, and change them as often as you'd like. Personalize the cards to suit your needs and print with either an inkjet or laser printer.Designed with ultra-fine perforations,cards separate cleanly and easily. Sheets are pre-scored for easy and neat folding. Easy to customize with free templates, create your own or select from pre-designed artwork. Even add a QR code, all with Avery® Design and Print online software. Card Size 3½" x 11"
For your next conference, seminar, wedding reception, and other events to add that personal touch. Tent cards can be used for small businesses to identify people, products, food plates and more. Product Descriptions: identify products, buffet food plates, ingredients for allergy sufferers. Ultra-fine microperforations allow you to easily separate tent cards from one another without the need for scissors or a blade. Premium paper is pre-scored for easy and accurate folding for a professional finish. Ideal for use as seating place cards, buffet cards, product descriptions and more. Present a strong business brand for all office events with premium cardstock in a variety of sizes, compatible with laser and inkjet printers.